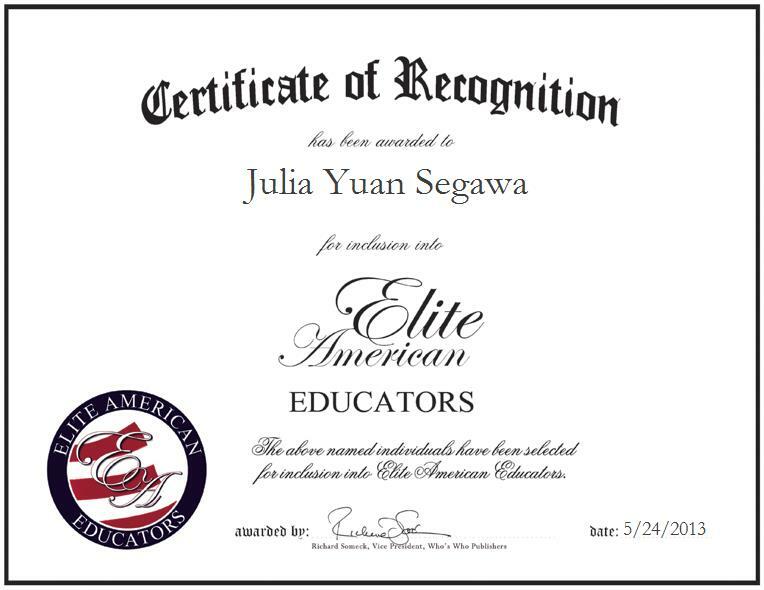 HONOLULU, HI, May 24, 2013, Julia Yuan Segawa, Teacher at Stevenson Middle School, has been recognized by Elite American Educators for dedication, achievements, and leadership in science instruction. Ms. Segawa, an award-winning educator, has garnered a reputation of distinction and prominence for her outstanding efforts over the years, as she has remained dedicated to helping students to achieve their academic goals. She currently teaches middle school science and AVID, a pre-college class to her students, in order to help them to achieve and to reach their highest potential. With a wealth of knowledge and experience refined over the course of an illustrious and rewarding career, Ms. Segawa strives for excellence in her every endeavor. She pinpoints the most gratifying aspect of her career as the gratitude that she receives from her students. Ms. Segawa has also received a Presidential Award for Excellence in Mathematics and Science Teaching from the National Science Foundation in 2011, and she remains abreast of trends and developments in her field as a member of the Hawaii State Teachers Union, the Hawaii Science Teachers Association, and the National Science Teachers Association.